This post serves to collect information from various sources about the details of the L2 sampling procedure. Summary: L2 authors have given different (and conflicting) accounts of exactly what the interviewers did and/or were supposed to do. They have made no final statement about what sampling plan was followed. Anyone who claims to "know" what the sampling plan in L2 was is lying. Let's begin with the description from the paper itself. 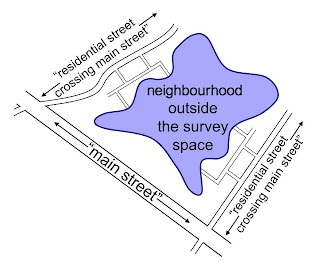 The problem with this description, as highlighted by the "main street bias" work in Johnson et al (2008), is that there are houses/streets that are not included in the sampling frame. Consider this figure from Johnson et al. It is obvious that some houses are not within the sample frame. Now, just because the stated procedure has this problem does not invalidate it. Given the time/resource constraints faced by L2, this approach is perfectly reasonable. The critical thing is not so much the exact approach used as it is transparency on the part of the L2 authors as to their procedure. The authors of L2 have still not fully disclosed their sample design (Bohannon, 2008, Spagat, 2007). Gilbert Burnham and Les Roberts have stated frequently that the L2 field teams did not follow the sampling methodology that was published in the Lancet but they have not supplied a viable alternative. Burnham and Roberts have also issued a series of contradictory statements about their sampling procedures and have either destroyed or not collected evidence necessary to evaluate these procedures. These lists of main streets are at the core of the claimed sampling methodology. Yet, the L2 authors have refused to provide these lists or even clarify where they came from. The footnote associated with this sentence is particularly damning. For example, Seppo Laaksonen, a professor of survey methodology in Helsinki, requested and was denied any information on main streets, even the average number of main streets per cluster (Laaksonen, 2008). This is the sort of behavior that makes me (and most statisticians) incredibly suspicious of L2. It is fine, perhaps, for the L2 authors to ignore me. I am just some random guy on the internet. It is fine, perhaps, for them to ignore Spagat et al since Spagat has been so critical of their work. But to refuse to answer a question from a professor of survey methodology with no particular axe to grind is just pathetic. If you are an academic, you answer questions from your fellow academics. Gilbert Burnham did make aspects of the sampling methodology fairly concrete in Biever (2007), an interview with the New Scientist. Whatever its strengths or weaknesses, this does seem to be a procedure that can be followed in the field. The L2 authors may no longer be able to specify their sample design since these pieces of paper have been destroyed. But they should be able to supply lists of principal streets or at least specify how many such streets there were per governorate. Burnham explains that the sampling information was destroyed to protect the identities of respondents, but this explanation is inadequate. Pieces of paper with lists of principal streets and surrounding streets would be of no use for identifying households included in the survey. Even lists of all of the households on a street that was actually sampled would not be usable for identifying particular L2 respondents. On the other hand, the L2 data-entry form that Riyadh Lafta submitted to the WHO contains spaces for listing the name of each head of household in addition to names of people who died or were born during the L2 sampling period. If the field teams could travel around with pieces of paper containing the names of their respondents plus many of their family members then they did not have to destroy lists of streets. Finally, as noted above in section 2, the lists of L2’s respondents would have been widely known at the local level in any case. A. Field teams wrote names of main streets on pieces of paper and selected one street at random. B. The field teams then walked down this street writing down names of cross streets on pieces of paper and selected one of these at random. C. The field teams then became aware of all other streets in the area that did not cross the main avenues and may have selected one of these instead of one of the cross streets written on pieces of paper. This wide selection was done according to an undisclosed procedure. The Biever (2007) description of Burnham does outline a sampling procedure that could have been followed and is broadly consistent with the published methodology. If other types of streets, beyond those that would be covered by the published methodology, were included in the sampling procedures then the authors need to specify how these streets were included. More fundamentally, how did the field teams discover the existence of such streets that could not be seen by walking down principal streets as described by Burnham in Biever (2007)? The L2 field teams would not have brought detailed street maps with them into each selected area or else it would not have been necessary to walk down selected principal streets writing down names of surrounding streets on pieces of paper. We can also rule out the possibility that the teams completely canvassed entire neighborhoods and built up detailed street maps from scratch in each location. Developing such detailed street maps would have been very time consuming and the L2 field teams had to follow an extremely compressed schedule that required them to perform forty interviews in a day (Hicks, 2006). Even if locals had identified such “pockets of homes away from the centre” the authors still would have to specify how these were included in the randomization procedures. Indeed, involving local residents in selecting the streets to be sampled would seem to be at odds with random selection of households. Locals could, for example, lead the survey teams to particularly violent areas. Burnham and Roberts have induced further confusion about their sample design by issuing a series of contradictory statements. “… we had an equal chance of picking a main street as a back street.” (The National Interest, 2006). These statements contradict each other and the methodology published in the Lancet. Some streets are much longer than others. Some streets are much more densely populated than others. Such varied units cannot all have equal probability of selection. If, for example, every street block had an equal chance of selection then households on densely populated street blocks would have lower selection probabilities than households on sparsely populated street block. If main streets are more densely populated on average than back streets are and main streets and back streets have equal selection probabilities then households on main streets would have lower selection probabilities than households on back streets. All this is bad enough. Yet Lancet defenders assert that these contradictions are unimportant, that such discrepancies are inevitable when researchers try to explain their work to the public, that much of the "conflict" is just caused by a reasonable effort on behalf of the Lancey authors to simplify. And that is a reasonable defense. But, to work, there must come a point at which we can point to a specific statement that describes the sampling plan used. What is the truth? Normally, the truth would be whatever is written in the published paper, but the Lancet authors now claim that the published work is not accurate. (And they have failed to publish a correction in the Lancet.) The truth could also be the official sampling plan that the authors created prior to starting the project. They must have written up a plan ahead of time. If they were to release that now, they could point to that. So, if the truth is not in the paper, or in a correction to the paper or in an official document released by the authors, where is it? Good question! No one knows. Burnham gave a presentation at MIT in February 2007. (See here for video, transcript and extensive commentary.) Let me quote my prior commentary. Burnham claims that they did not restrict the sample to streets that crossed their main streets. Instead, they made a list of "all the residential streets that either crossed it or were in that immediate area." This is just gibberish. First, if this was what they actually did, why didn't they describe it that way in the article? Second, given the time constraints, there was no way that the teams had enough time to list all such side streets. Third, even if the interviewers did do it this way, the problem of Main Street Bias would still exist, except it would be more Center Of Town Bias. Some side streets are in the "immediate area" of just one main street (or often in the area of none) and other side streets (especially those toward the center of a town or neighborhood) are near more than one. The later are much more likely to be included in the sample. Again, it is not unreasonable for there to be some confusion in the immediate aftermath of publication about exactly what the interviewers did. My point here is not to attack Burnham for an in artful phrase like "equal chance" as used in an interview. But, given that this was such an important matter of public concern, I would expect Burnham to have his story straight by the time that he spoke at MIT, 4 months after publication. But things are even worse that that! Sampling for the 2006 study was designed to give all households in Iraq an equal chance of being included. This statement can not possibly be true. How can the authors, more than a year after the study was published, assert such an obvious falsehood about the single most important criticism of the study? But, even though this is a false statement, it is at least a clear one. Want to know what the official sample plan was? Don't check the paper. (It's wrong.) Don't look for corrections. (None were made.) Don't look for the original planning documents. (They were never released.) But, at least there is an official statement on the Johns Hopkins website. When Tim Lambert and other Lancet defenders want to claim that the sampling plan was such and such, they could link here as evidence. But then the Lancet authors deleted that page! (This was in a conjunction with various other false statements made on the web page as well as other unexplained deletions.) So, the official word is that there is no official word. The last clear statement made by the Lancet team --- a statement that, one assumes, supersedes the published paper and other interviews given by the authors --- was removed from the web without any explanation. Anyone who claims to know the sampling plan used in L2 is lying.